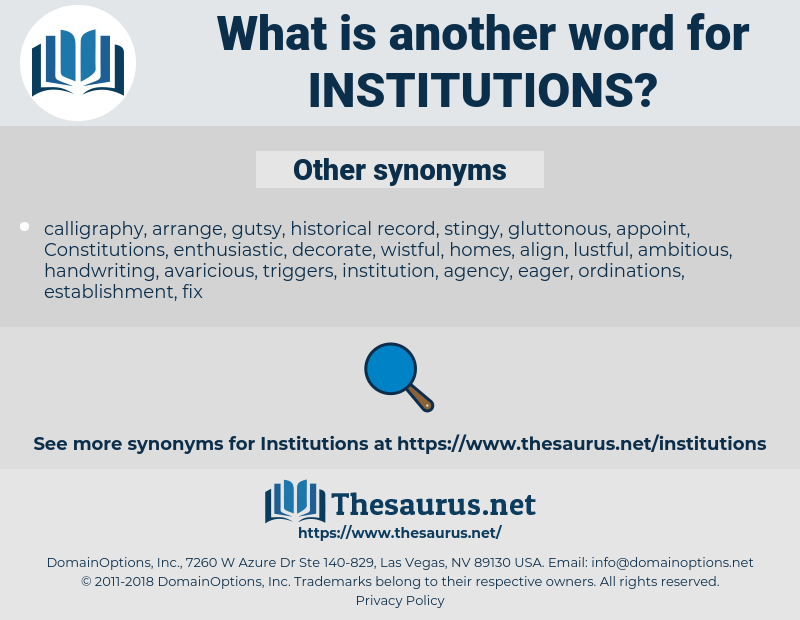 What is another word for institutions? 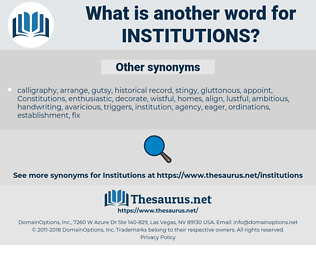 institutionalizing, institute, Institutes, fund, agency. clinics, Hospitals, institute, Institutes, agency. administrations, Societies, locations, Universities, archives, nations, Regulations, Faculties, boards, residences, Resources, courts, Firms, holdings, tribunals, entidades, Studies, shops, SMES, hubs, Undertakings, Standards, partners, men, forces, directors, Languages, -rrb-, jurisdictions, states, places, points, NGOS, organismes, etablissements, centros, arrangements, devices, Rights, Activities, Bodies, Facilities, organs. jurisdiction, jurisdictions, instns, HEIS, point, points, infrastructure, infrastructures, international, promotion, NGOS, topic, organismes, treasury, government-wide, eurosystem, non-bank, etablissements, U.S., centros, environment, OSFI, cis, PISG, arrangements, donor, Of, EMIS, funding, objective, biota, librarians, various, republic, social, priorities, Nis, other, equipment, estatal, systemic, Operators, focal, kingdom, devices, political, central, cultural, warden, federally, high, methadone, public, appliances, Rights, Du, natural, therapeutic, human, alberta, europe, tax, china, b.c., september, trade, may, officers, december, Activities, table, chief, chemical, review, land, new, Parties, figure, e, Foundations, number, institut, body, Bodies, facility, Facilities, recipient, organs. instructions, banks, installations, intuitions, circumstances, commissions, administrations, constitution, Constitutions, Stations, situations, conditions, Prisons, Missions, operations, sections, Societies, questions, locations, collections, purposes, unions, functions, funds, councils, Industries, Universities, instruments, formations, customs, personnel, Recommendations, investors, SOES, museums, discussions, nations, Instrumentalities, accommodations, instances, regions, relations, years, elements, Regulations, Students, fields, lisbon, reservations, co-operatives, Communities, things, Investments, campuses, dissemination, ministries, Households, Faculties, times, occasions, interests, elections, contributions, initiatives, issues, requirements, boards, reasons, Forums, Fora, observations, arms, confines, credentials, entrepreneurs, Branches, provisions, quarters, counterparties, principles, actions, Penitentiaries, networks, proceedings, cooperation, interpreters, Subsidiaries, terms, residences, committees, Persons, residents, projects, Intermediaries, ventures, academics, Resources, courts, Firms, Colonies, holdings, Constituencies, channels, graduates, intelligent, components, Apparatuses, counterparts, assets, commissioner, others, restaurants, regulators, ways, outlets, mills, venues, doctrines, tribunals, representatives, workings, stores, professionals, Workshops, Environments, Asylums, hostels, suppliers, offenders, links, organisers, weapons, entidades, lenders, concepts, orders, months, works, laws, flexfields, Nurses, processes, offices, words, caisses, constant, sources, Donors, Studies, contributors, Programs, acts, retailers, police, Respondents, subjects, amenities, individuals, claimants, report, procedures, shops, costs, Efforts, SMES, clubs, minister, hubs, tools, matters, organizers, Opportunities, Undertakings, objectives, applicants, Measures, auditors, hotels, kindergartens, citizens, users, flats, findings, optional, events, ICTS, RCHES, Countries, drafting, Minorities, eyes, statements, Assemblies, shelters, cooperatives, loans, programmes, customers, sets, Standards, concerns, accounts, trends, schemes, modalities, clientele, Adults, comments, Guidelines, obstacles, expenses, statistics, occupancies, dwellings, candidates, reserves, assurances, methods, skills, experts, rules, partners, educators, participants, charter, consumers, exchanges, preschools, proposals, competencies, utilities, aircraft, Capacities, imf, practices, presences, Clients, stakeholders, data, frameworks, employers, products, Pupils, media, top, reforms, men, forces, women, directors, mandates, chambers, teachers, cheques, directives, protocols, agents, Elles, needs, Roles, Ones, Carriers, people, circles, provides, requests, Capabilities, patterns, principals, officials, challenges, markets, norms, Treaties, changes, levels, Languages, Canadians, Boxes, Cells, SPAS, Children, payments, powers, farms, approaches, Morales, targets, demands, -rrb-, contracts, crates, Properties, employees, wards, plans, Areas, sides, jurisdictions, Workplaces, types, players, walls, actors, members, french, 23, 1998, states, jails, places, gaps, Forms, cases, lands, spaces, 24, Bases, 250, problems, claims, Prices, ", 2004, points, :, debates, 99, Ais, 84, figures, infrastructures, 1996, meetings, promotion, NGOS, goods, organismes, arrangements, Operators, devices, appliances, Rights, Activities, Parties, Foundations, body, Bodies, Facilities, organs. requires, places, body, Bodies, organisations. As an immediate answer there came an ever increasing demand for true graduate work, not only from graduates of the University, but from those of other institutions as well. They sometimes take the form of a claim that our institutions were founded long ago; that changed conditions require that they now be changed.